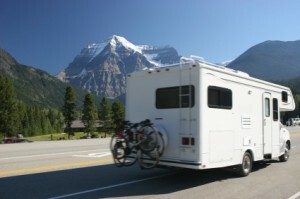 Canada is one of the most exciting places to take a motorhome holiday in the world! With many interesting cities, like Toronto, North Vancouver, Montreal or Halifax, as well as some of the most impressive natural scenery imaginable, Canada is simply great for a trip which combines activities such as hiking, rafting and fishing with city travel. Canada has just about every natural habitat going, from ice-bound polar islands in the far north to sun-drilled pockets of desert along the United States border. Between these extremes, the country’s mountains, forests and grasslands support an incredible variety and profusion of wildlife ready to be discovered by the adventurous motorhome traveller. For those wanting a motorhome holiday that takes advantage of the outdoors, the best time to visit is in the summer when the roads will be clear and most of the activities Canada has to offer will be available. Maple-syrup festivals and lumber-jacking contests celebrate all it is to be Canadian, and are a good indication of the pride that many Canadian’s feel regarding this astonishingly beautiful country. With Canada as your chosen motorhome holiday destination, the challenge is how to decide where to go and what to see and do. Motorhome rental is an ideal way to make the most of your precious time in this vast continent. Canada’s most southerly region, south Ontario, contains Toronto: Canada’s largest city and home of the Niagara Falls, which should be top of the list for any motorhome itinerary. Drive north of Toronto to the scenic attraction of Georgian Bay, a beautiful waterscape of pine-studded islets set against icy blue waters. Take your rental motorhome to Québec and experience the French tradition particularly evident in Montréal, a vibrant mix of old-world style and modern commercialism. Park your motorhome in the historic provincial capital, Québec City, or choose the easy-going villages dotted along the St Lawrence lowlands for a more relaxed feel. Drive your motorhome across the mouth of the St Lawrence, where the pastoral Gaspé Peninsula borders New Brunswick and see the beginning of the three Maritime Provinces. This area is largely dependent on timber and the sea for its economy and visitors can explore a number of enchanting fishing villages – which are at their most charming near Halifax, the bustling capital of Nova Scotia. Back on the mainland, separating Ontario from Alberta and the Rockies, visitors will find the provinces of Manitoba and Saskatchewan. If you are on a long trans-Canadian journey then the city of Winnipeg makes a good place to stop and enjoy Manitoba, but there is less to hold the traveller here than in the rest of Canada. If you are looking to embrace the outdoors then drive your motorhome straight to Ontario. Polar Bears and breath-taking beauty make this area an irresistible location where you can indulge in such sports as white-water rafting and cannoning to your heart’s content. Drive west and you will see the endless wheat fields of Alberta, beautiful in their sheer scale, as you approach the Canadian Rockies. Park your motorhome in the provincial capital, Edmonton, and use it as a handy base for a venture into these incredible mountains. Canada’s mountains, lakes, rivers and forests offer the opportunity for even the keenest motorhome user to indulge in a vast range of outdoor pursuits. Numerous national parks have been established to preserve and make accessible the Canadian landscape where motorhome visitors can enjoy activities such as whale-watching, horse riding, and fishing. Motorhome Hire Canada.